Innovation Enablement is standardizing on new and emerging technologies to become ready for the future. If you hear in the organization people say: we should have done that years ago because now we are stuck with...., this means there was an opportunity to enable innovation. But the reason it was not done, was because there was no short-term need to change things. Innovation Enablement is developing strategies and scenarios to see where there are opportunities to enable innovation. Suppose there is currently no need for artificial intelligence as technology in your organization. But you, an expert in the field, already know, that if you would want to start implementing AI solutions, current self build software applications are hard to integrate. In this case, it would be very innovation enabling to replace or switch-off the self-build solution. How Does Dragon1 Support Innovation Enablement? Working with Enterprise Architecture and using Dragon1 for that, leads to increasing the ability to change and transform. This by removing outdated and blocking solutions and technologies from your organization beforehand. On the Dragon1 platform you design and create visualizations to identify which systems, solutions and technologies are outdated and blocking innovation and how they can be removed or replaced. For instance, every organization should be redesigning processes so that faxes are not used anymore, ensure that Excel is not used for reporting and that Email is not used for workflow information and status or progress updates. Just visualize how these solutions are used and why and how they should and can be replaced. If you do this you enable future innovation. On Dragon1 you can design and redesign business processes and use them to reduce the usage of outdated solutions and technology step by step. If you to want to implement new technologies and concepts like artificial intelligence, block and IoT in order to innovate your business model, you can create concept diagrams, principle details diagrams and solutions diagrams and map these onto the process and application landscape diagrams. Also Dragon1 supports you in documenting every aspect of EA in a dossier and making this available to projects and stakeholders. In this way, you make sure that everyone exactly knows how everything is currently configured, related and works in the organization and what the impact of the change is on anything is in the near future. With that, the constructions or outdated standards and technologies that may be blocking innovation can be removed or phased out step by step. With EA you really become ready for the future. Dragon1 as EA method supports you in creating the necessary holistic views on the enterprise. 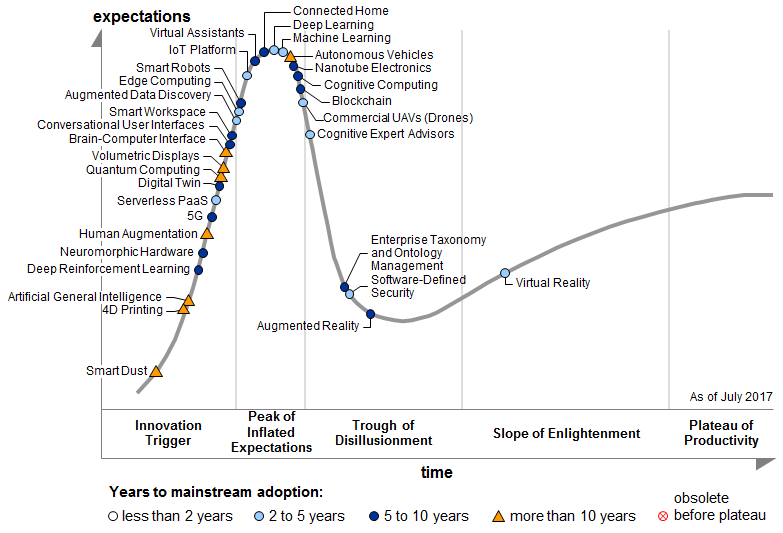 Hype-trends diagram, to look into the future of what new concepts will become popular. Example Hype cycle you can create and relate to the strategy map on the Dragon1 platform. We have use cases as anonymized projects from practice, that provide Innovation Enablement as benefit.